The appeal of going anywhere, any time is the whole reason civilian Jeeps exist. 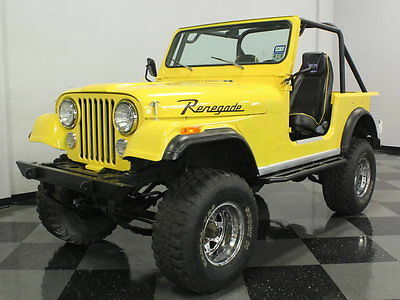 The past seven decades are proof that the original design is a good one, but if you like your 4x4s to be affordable as well as tough, then this 1979 Jeep CJ7 should be just the ticket: reliable 6-cylinder power, high-impact cosmetics, and a stylish interior all add up to fun in the dirt on a shoestring budget.As we've seen over the past few years, the CJ7 is at the top of the food chain when it comes to Jeep off-roading. Unfortunately, their rugged off-road abilities are the reason why so few good ones are left: they simply got used up. So when this one showed up, complete with a beautiful bright yellow paint job and sheetmetal that doesn't look like it's been bashed and abraded off road, we eagerly ushered it into the showroom. It's still pretty basic and keeps all the great original attitude that makes these so much fun and hasn't been upgraded, over-dressed, or modified so heavily that its originality is erased. Instead, they gave it a vivid paint job that definitely gets noticed and left off the stuff that doesn't help it work better in the dirt. That means simple black bumpers with chrome tow hooks, low-key side steps, diamond-plate reinforcements on the corners, and rubber fender flares over the oversized tires. 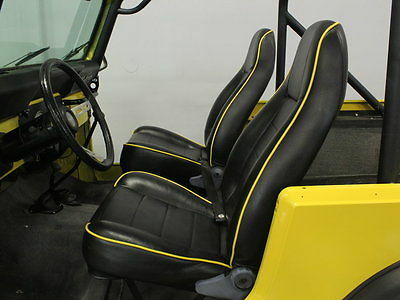 In short, if you like the elemental appeal of the Jeep, this one definitely delivers.The all-business interior is highlighted by a pair of new black and yellow bucket seats that are a lot more supportive for off-road maneuvers than the original chairs and there's still a matching back seat. The floors have been covered in black carpets, giving this Jeep a civilized feel and the skinny AMC steering wheel is easy to hold on to during the rough stuff. The original gauges are framed by a simple black painted panel and a later AM/FM/cassette stereo lives in the middle of the dash, although it's overdue for an upgrade. For inclement weather, there's a bikini top which does nothing to diminish the elemental feel of the Jeep, and there's no better way to enjoy the great outdoors than from behind the wheel of your open 4x4. There's no back seat, so this is strictly a 2-seater, but that leaves a ton of room for your gear, and you know you're going to use it.The engine of choice for most Jeep fans is the indestructible 258 cubic inch inline-6. Power isn't what it's about here, it's about getting where you're going and back again, and this engine has proven itself time and time again. 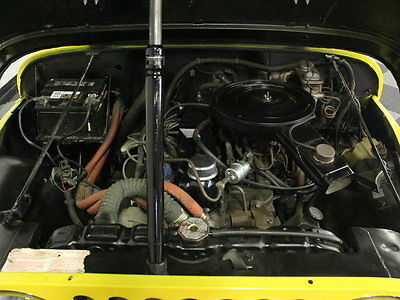 It's quite stock under the hood and shows signs of frequent and conscientious maintenance, and you know the Jeep engineers knew what they were doing when the put all the important stuff like the battery, alternator, and carburetor way up high. Power steering is a nice feature in something with tires this big, and the 4-speed manual transmission has well-chosen gears for any occasion. The transfer case, axles, and suspension are trail-ready, again with many new parts visible underneath, including a modest lift. Shiny chrome wheels look great against the yellow paint, especially with those big 33x12.50-15 off-road radials.So for reasonably-priced off-road fun, this CJ7 delivers in a lot of big ways. Fun, reliable, comfortable, and still very capable, it has all the virtues of the best 4x4s without the big price tag. Call today!